The latest iPhone might be made of surgical-grade steel and have beyond-DSLR photo specs, but if one rings in a room full of iPhones, can you tell the difference? Since practically everyone — or better put, practically everyone with an iPhone — uses the default “Marimba” ringtone, it’s unlikely. 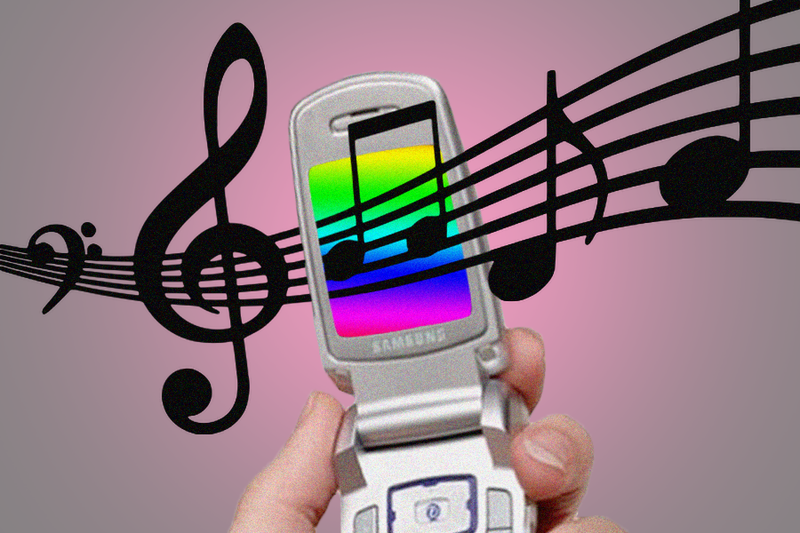 Before 2014, however, most ringtones were songs — not to mention, a highly considered arm of music sales, generating an estimated $714 million in sales. They even inspired a new genre of music — “Ringtone rap,” an insult really, used to denote dumbed-down tracks optimized for ringtone playability. See: “Ridin’ Dirty” by Chamillionaire, “Laffy Taffy” by D4L and “Crank That” by Soulja Boy. In a very early meta-example, Fabolous’ 2001 hit “Holla Back” (produced by the Neptunes) features a custom ringtone at the 49-second mark. More personally, in pre-”Marimba” 2004 — two years after getting my first cell phone — I discovered the free audio editing program, Audacity. Using its simple interface, I imported an MP3 of my choice, cut out a 15- to 30-second segment, compressed it to reduce file size and emailed it to my LG flip phone. It was usually a song by The Game, 50 Cent or some kind of instrumental meant to signal I was cool but also brooding. But as our phones have become more advanced, we’ve accepted a step back in ringtone technology, or at least stagnation. Old cell phones would give you the option to, like me, create your own ringtones, by either creating a custom series of lame beeps, or eventually allowing for an MP3 file of your choice to play when receiving a call. Now, however, it’s just Marimba, depriving us of perfect moments, like when your phone rang several times, playing a long clip from George Michael’s “Careless Whisper” at full volume in a library, because you had your headphones on. Apple is at least partially to blame. There’s nothing Steve Jobs hated more than people mucking around inside his devices. Remember: It doesn’t matter how it works, it just works. Nor was he ever looking to appease the intrepid tinkerer, preferring to provide devices so proficient you didn’t need to mess with them — and that also looked “so good you’ll want to lick them.” Still, there was enough blame for declining ringtone sales to be able to spread around. CNN, in fact, marked several factors: an increasing use of text messaging; savvy users making their own ringtones (circumventing the need to purchase a ringtone); and the ringtone’s novelty simply wearing off. It’s difficult to pinpoint when exactly I stopped making custom ringtones. I do know, though, it was a growing disinterest over several years, rather than one fateful day. It also could have been a natural function of growing older and losing the capability to find joy in meaningless quirks. More practically, I usually have my phone on vibrate, since it’s always in my hand or pocket, unless I’m unconscious. So there was no one to listen to my ringtones anymore — most of all, me. Ringtones obviously are not a substitute for a personality. But each of these little choices do reflect personality, since a person can choose (or choose not) to customize this device they use all the time. And so, if we’re going to stare at these stupid devices as soon as we wake up, on the train, on the toilet, before sleeping, while waiting to cross the street and wherever else we find ourselves in life, we should grasp onto any (false) sense of agency that we can get. After all, if we’re going to leap at the command of a small device, can’t we at least decide what those orders sounds like?